Ring legend Manny Pacquiao may be nearing the end of his illustrious career but the 39-year-old still has a bit more mileage left before he finally calls it quits. Manny retains strong political ambitions in his native land and recently claimed that he turned down a mammoth $100million payday to face old rival Juan Manuel Marquez for the fifth time. If Pacquiao does continue in the noble art, who could he face over the next year or so as he embarks on the next stage of his retirement tour? One fighter Pacquiao is expected to face in 2018 is Jeff Horn as the Filipino looks to reverse the controversial decision that went the Australian’s way in their 2017 bout. Personally I thought Horn won the fight, but many observers disagreed, feeling ‘Pac Man’ had clearly done enough. The plan was laid out for Pacquiao to dismiss Horn, count his cash and roll on to the next money-spinning mega fight. That may have taken place in the UK with Kell Brook or Amir Khan waiting in the wings but Aussie Horn spoilt the best laid plans. ‘The Hornet’ recently outmuscled and outhustled WBO title challenger Gary Corcoran in Brisbane. 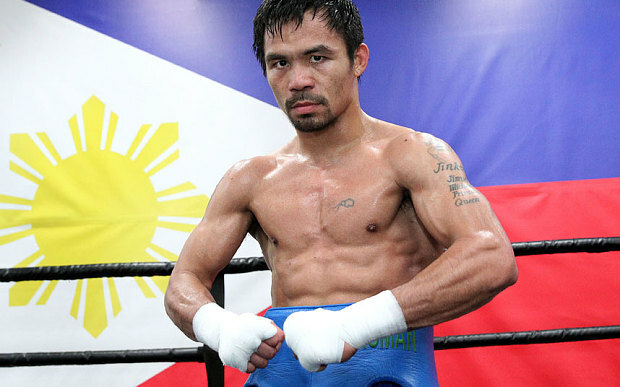 Would Pacquiao have the legs and fortitude left to go 12 hard rounds with the current champion? Terence Crawford has long been linked with a Pacquiao fight but that ship may be close to sailing as it becomes increasingly less competitive as the months tick by. Pacquiao is well past his prime and Crawford would be the favourite to certainly outpoint and possibly even stop him. Freddie Roach has gone on the record in the past saying that Manny can still make 140 if necessary and he now has Omaha’s Crawford up at welterweight to contend with. Promoter Arum may be getting closer to letting Pacquiao fight Crawford, knowing that it’s likely his once most prized asset is on the way out. Vasyl Lomachenko is a name that has been floated about of late as a potential future foe for Manny and it’s maybe not as outrageous as you first might think. Bob Arum recently confirmed that he would not be averse to putting on a Pacquiao-Lomachenko scrap on in the near future and despite campaigning at welterweight, Pacquaio is small and has no trouble making the 147 limit. Could he move down to take on the Ukrainian matrix? Heavy-hitting Argentine Lucas Matthysse is now competing at welterweight and he could force his way in to a clash with Pacquiao. Matthysse must first negotiate a way past Thailand’s unknown puncher Tewa Kiram on January 27. Matthysse’s fearsome 81 per cent knockout ratio may not be conducive with Pacquiao’s health though, at this late stage of his career. Matthysse has shown a propensity to be outboxed, however, and Pacquiao could follow a blueprint laid down by the likes of Zab Judah and Devon Alexander to neutralise the attacking threats of the 35-year-old South American. One fighter who doesn’t appear to be engaging with Pacquiao anytime soon is the ubiquitous Conor McGregor. Fresh from his big summer showdown with Floyd Mayweather, McGregor has ruled out a fight with Pacquiao and continues to leave his future open.